new ghosts walk the lawns. I find it fascinating that you are able to find inspiration in my modest snaps, your poems exceed my pictures. Which is good 🙂 It feels nice to think of oneself as a muse! They are paired. Like cheese and wine. Wow! It’s like a mixture of beauty and sadness – don’t know why… but a great mixture! 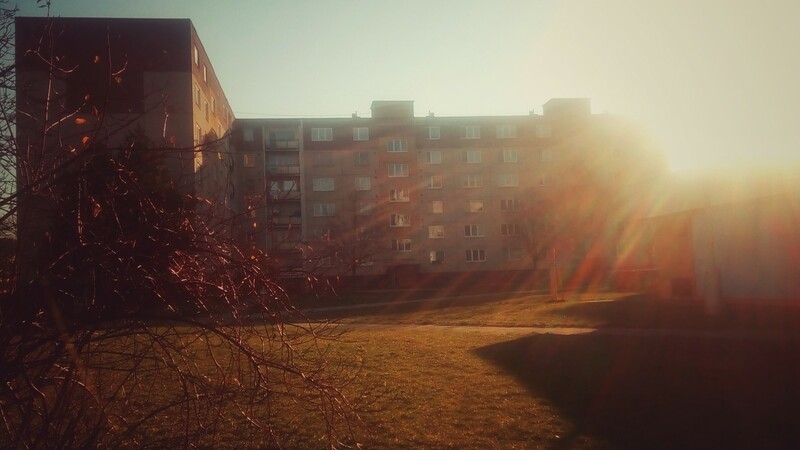 Might be… Or maybe also that large apartment complex reminded me of some sort of “beaulieu” where usually people living there are filled with problems and rather sadish… and yes, in contrast with the cheerful beauty of the sunrays. It’s a great shot! Yes, that’s true. It is this kind of social housing where people are generally not very happy. But then, it’s not the worst in the town, it’s actually quite a tolerable place to live. It was shot near my place, but I live in a new building – curiously erected among old buildings. Oh you used to live in Prague? How did you come to live in Prague, of all places? I can imagine what kind of building you mean though. It’s funny to study English in Prague, but surely why not! I’m by extension proud that you enjoyed your stay. It’s only another person’s perspective that makes one appreciate what one has, such as one’s own capital city. I know what you mean – every time I hear someone say something nice about my motherland it fills me up with pride ❤ One likes seeing strangers feeling good about your own country.